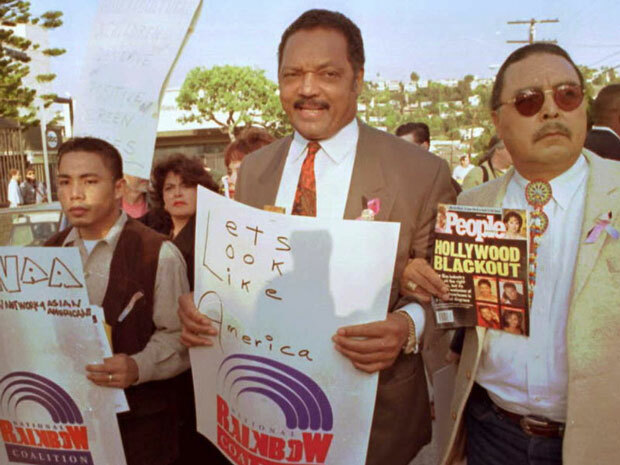 Jesse Jackson and members of the Rainbow Coalition protested the 68th Annual Academy Awards in 1996 for not producing more motion pictures with minorities. "The fact that there is an absence of African-American nominees at the awards this year is something I&apos;m less concerned about than how that reflects on what&apos;s happening within the industry," [the film producer Preston Holmes told a reporter]. "We need more opportunities for African-American filmmakers and crafts people. There needs to be more of an African-American presence in the various unions and guilds." Thing is, Holmes, who is black, said that way back in 1996. Holmes gave that interview amid calls to boycott that year&apos;s Oscars for being devoid of nominees of color. The whiteness of that slate of nominees even made the cover of People magazine. Jesse Jackson asked black folks in Hollywood not to attend the ceremony. Even that wasn&apos;t the first time black folks tried to protest an alabaster Academy Awards ceremony. The Oscars&apos; trouble with racial representation feels like a fresh, contemporary controversy, a product of the social media megaphone, but it goes back almost to the beginning. At the 12th Academy Awards ceremony in 1940, Hattie McDaniel won a statuette for her role in Gone with the Wind, becoming the first black actor to win one. But before that happened, she was almost literally shut out of the ceremony, as strings had to be pulled to let her into the venue, which had a strict no-blacks policy. She wasn&apos;t allowed to sit at the same table as her co-stars, and was instead stashed away in a corner. By the 1960s, black actors were starting to push back. According to Ellen C. Scott in the book Cinema Civil Rights, a modestly successful black actor named Caleb Peterson, who felt black folks were systematically denied onscreen and offscreen jobs in Hollywood, formed a group called the Hollywood Race Relations Board in 1962. They picketed at theaters, studios and that year&apos;s Oscars ceremony. "Peterson recognized that although the Academy was not the institution granting jobs, it was the one defining success," Scott wrote at The Common Reader, a literary journal from Washington University in St. Louis. "[He promised 500 pickets] starting days before the ceremony if the Academy failed to agree to their right to protest. &apos;They roughed up one or two of our boys last year and this year if they try it, they&apos;re in for a good fight. ...We lay the whole responsibility on the Academy, not the police. If they rough us, there will be violence. This is no Martin Luther King movement.&apos; "
Jesse Jackson&apos;s attempt at a boycott in 1996 wasn&apos;t nearly as gully, but it proved to be just as polarizing, and not just among white folks. Whoopi Goldberg, who was hosting the show that year, was heated at Jackson for putting her in such an awkward position. Oprah Winfrey, who was the Oscars "official greeter" that year — because apparently that&apos;s a thing — angrily clapped back at Jackson, calling that year&apos;s event "the most multi-ethnic Oscar show anybody&apos;s ever seen." A few weeks ago, in the midst of the #OscarsSoWhite furor, SNL took up the issue of the monochromatic awards season once more. But 20 years after Darrell Hammond&apos;s goofy Jesse Jackson impression, this time around it was the Hollywood establishment that was being (gently) mocked. The weather vane appears to be turning.